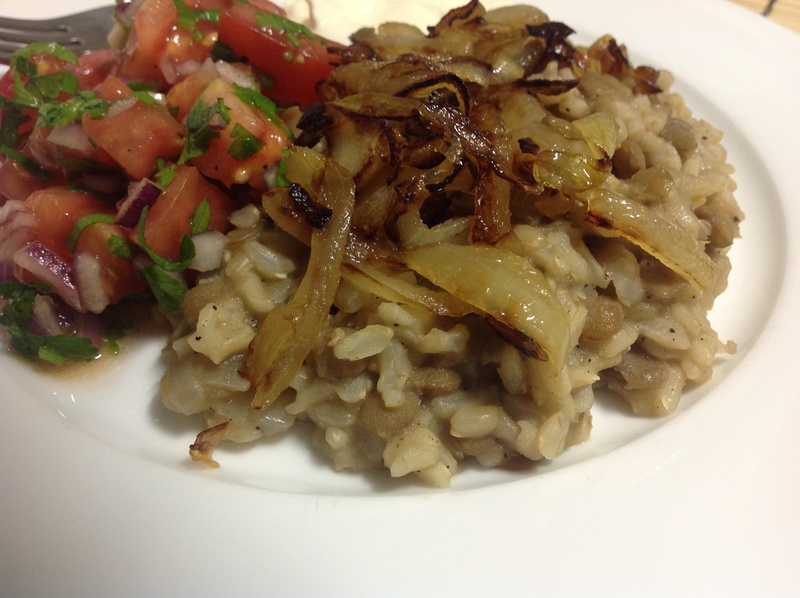 Yet another Lebanese Lentil dish. I did say we love lentils in this house. I cooked a corn beef on Monday night, then made fritters out of left overs yesterday and then corn beef and mustard pickle sandwiches for lunch today. We are all corn beefed out. A quick SMS to my husband and tonight’s dinner is decided. Healthy, vegan and delicious – Mjadra…. Rinse the lentils then put in a medium saucepan. Pour over cups cold water, cover and bring to the boil. Once boiling turn heat down to medium low and let simmer for 10 minutes. Meanwhile chop 3/4 of a large onion into large dice and gently fry in 2 tbs olive oil until soft and just starting to brown on the edges then throw them, along with the oil, in with the lentils. When it’s done, turn the heat off and leave it covered while you thinly slice the rest of the onion and brown in 1 tbs olive oil with a sprinkle of salt. This is then served on top of the Pilaf. We like this dish with a fresh tomato, onion and parsley salad and a spoonful of Greek yogurt. Yet another Birthday. My sister’s turns #? 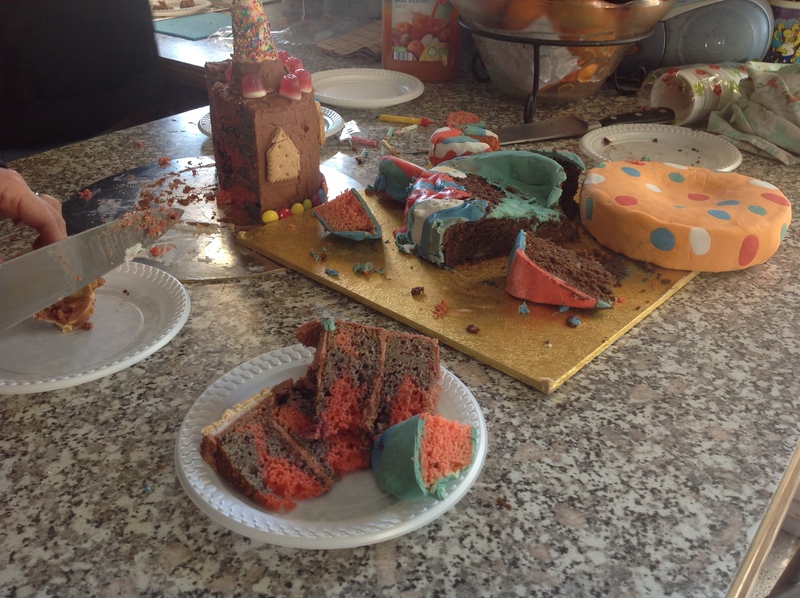 on Wednesday but Sunday is family get together day so Sunday, we eat cake. 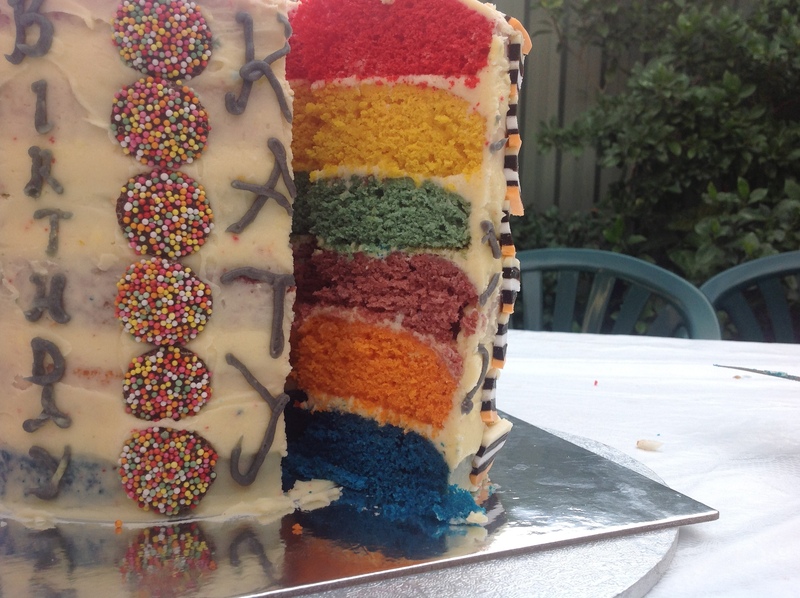 Katy’s cake of choice this year – Rainbow Cake. Fine choice too. A very simple Vanilla Butter Cake – With an electric mixer, beat together 250g chopped butter with 220g castor sugar until light and fluffy, then beat in 4 eggs (one at a time) with 2 tsp vanilla extract. Next sift in 80g almond meal (ground almond), 260g plain flour, 10g baking powder and pour in 60ml milk. Mix on low speed until well combined. Divide batter into 3 bowls, add a few drops of food colouring and mix well. Butter and line 3x18cm cake tins. 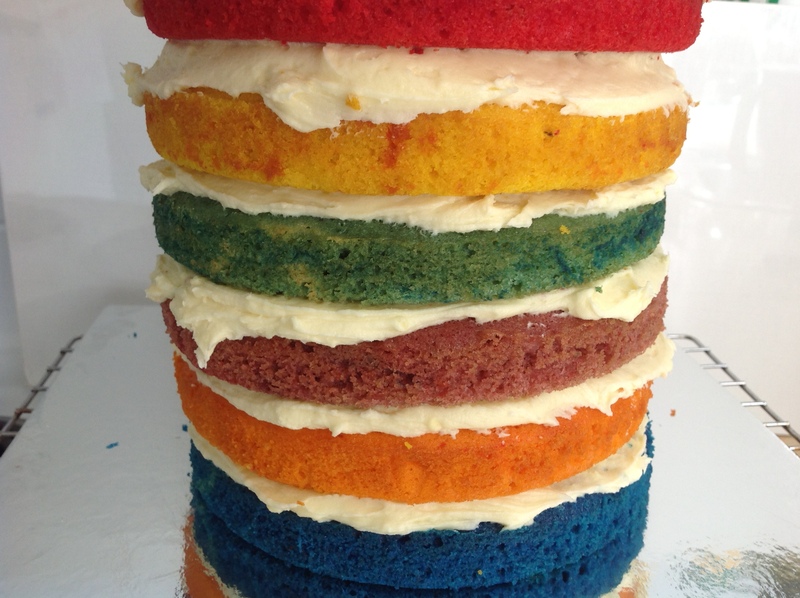 Pour each coloured batter into a separate tin and bake at 160c for 22 minutes or until cooked. 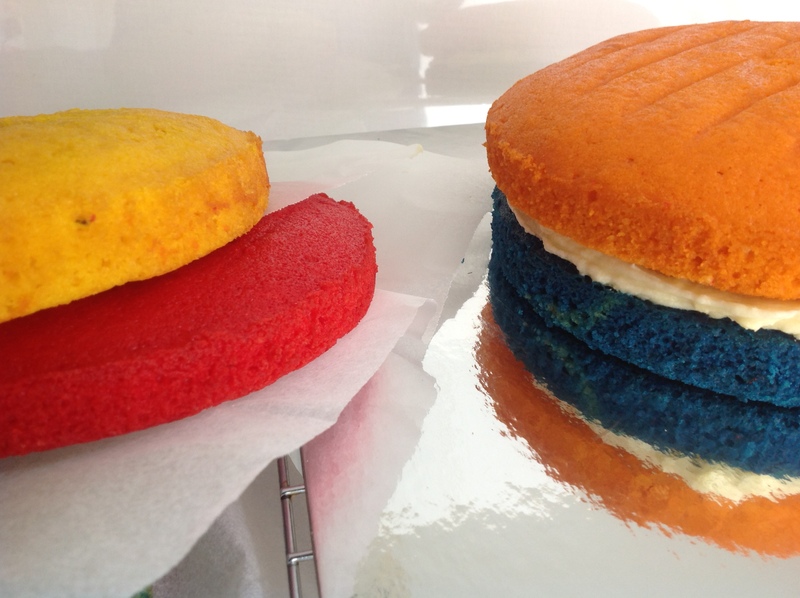 Let the cakes cool for a few minutes in the tin then take them out and let them cool completely on wire racks. Cream cheese icing – In electric mixer beat 250g chopped butter with 250g cream cheese until white and very smooth. Gradually beat in 500g sifted icing mixture and finish of with 2 tsp vanilla extract. Now just spread cakes with icing and put them on top of each other. Leave enough icing to cover the sides of the cake. Decorate with whatever sweets you (or whoever’s eating) like and serve. 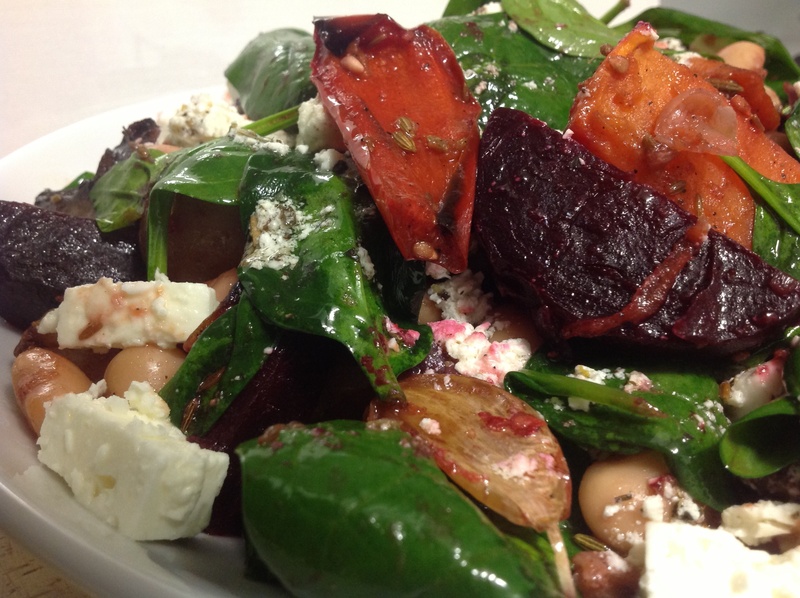 Dinner tonight is going to be a very healthy roast vegetable, butter beans and goat feta warm salad so we can indulge in some dessert. Usually Granny Smith apples are used in apple desserts but I use whatever’s in the house, in this case, royal gala apples. I’ve played around with many crumble mixes. Some with coconut, some without, some with different nuts, seeds and sugars. 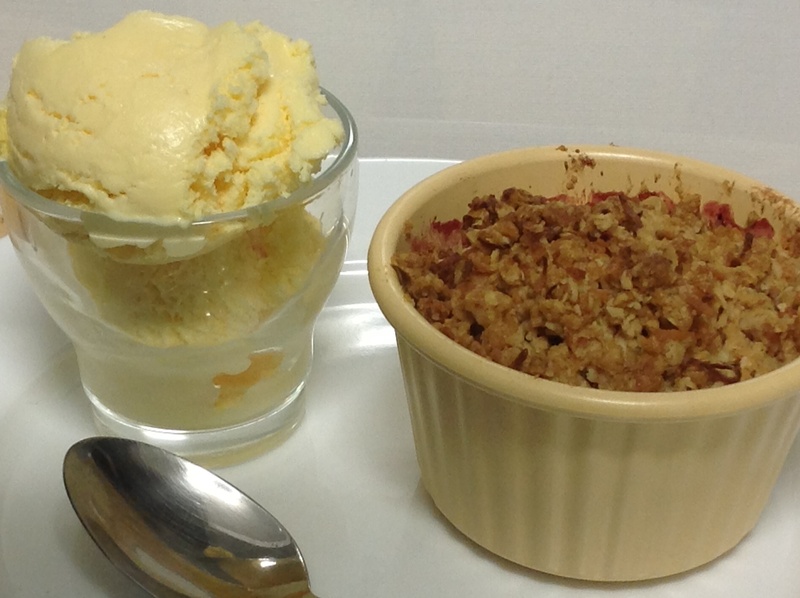 This particular crumble I’ve adapted from a Margaret Fulton Date and Oat Slice recipe that I’ve been using for years. It’s one of my husbands favourite treats. 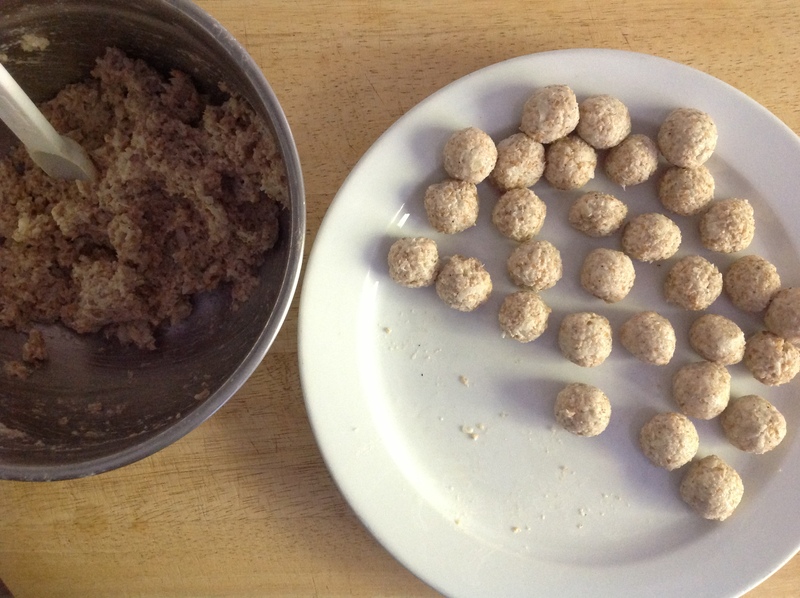 Simply rub 75g of butter into 55g of wholemeal flour and 35g rolled oats. Add 30g brown sugar and 30g shredded coconut and mix together until well combined. Set aside. 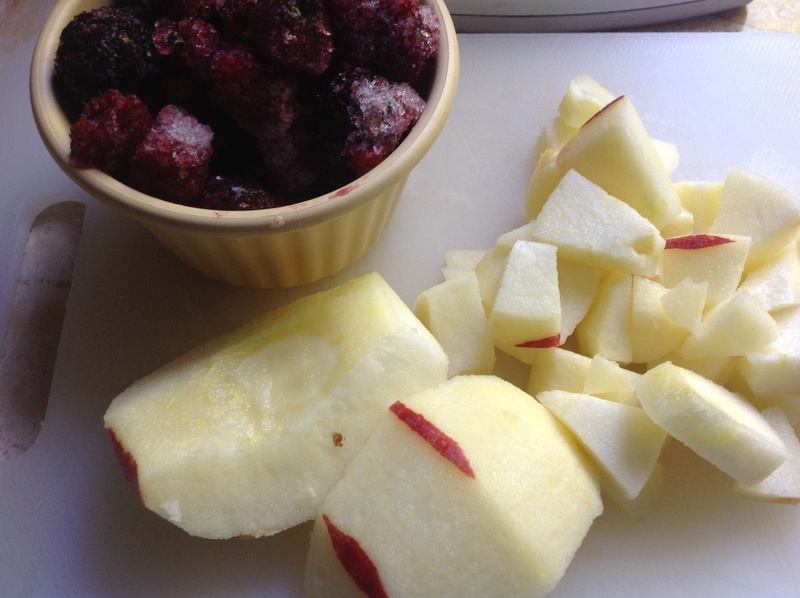 Next, peel and core 1 large apple, then chop into smallish cubes. Throw into a bowl with 100g frozen (or fresh if they’re in season) mixed berries, 20g finely chopped glacé ginger, 1/2 tsp ground cinnamon and 40g brown sugar. Mix well. 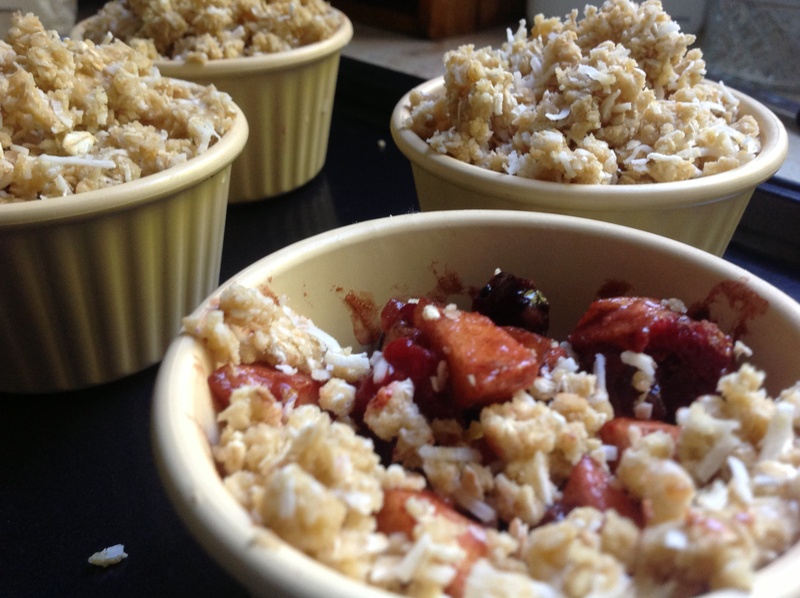 Now spoon the apple mixture into a small, deep oven proof dish, sprinkle the crumble mix over the top and bake at 180c for about 35 minutes or until the top is golden brown. 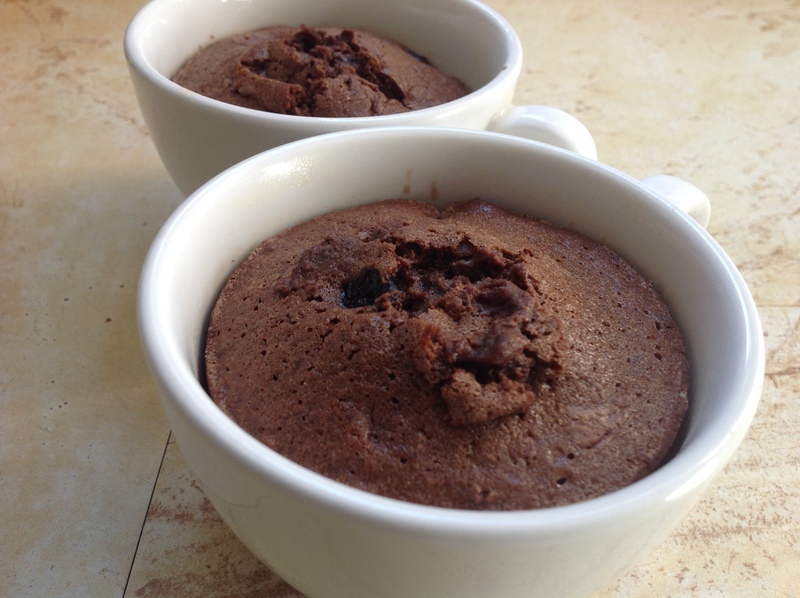 I made 4 x 1 cup individual servings, but it’s up to you. Take it out of the oven and let it cool down for a while before serving with custard or ice cream. Wonderful winter dessert after what’s been a healthy food week for us. Two birthdays were celebrated at my mum’s. Two very happy nieces. As per our tradition, whoever is having a birthday gets to 1. Select the lunch menu, and 2. Select their birthday cake. 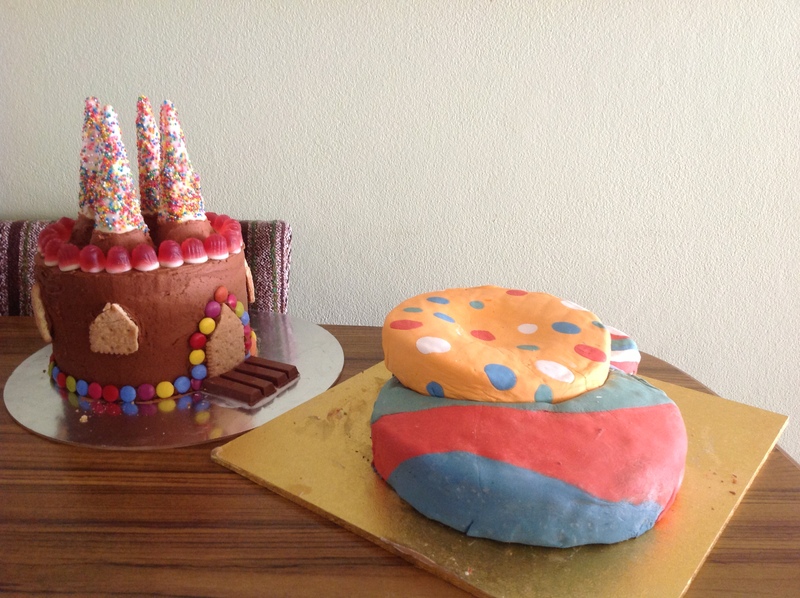 My Saturday night was spent baking and decorating two very different cakes.I had a ball. We had perfect cool but sunny weather, and very full bellies. 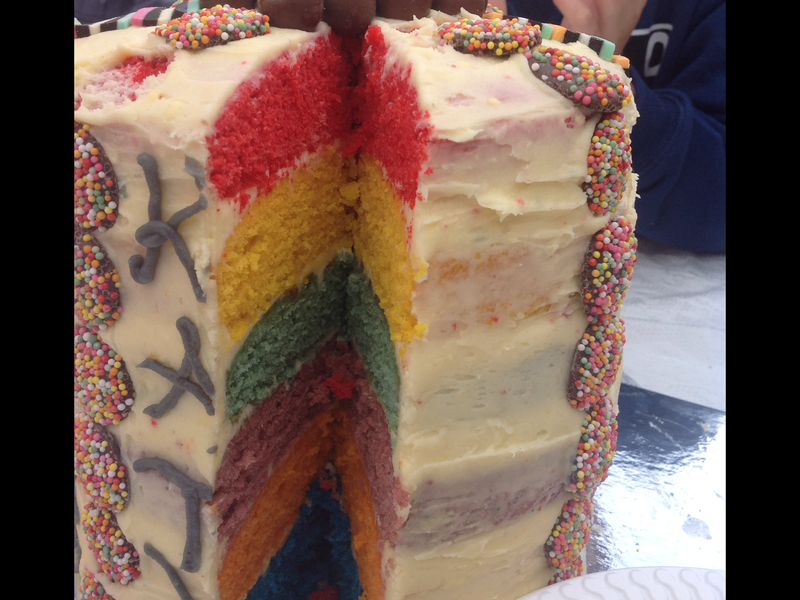 However, there is always room for cake. Let me tell you now, my family is absolutely insane and we have the time of our lives when we get together. 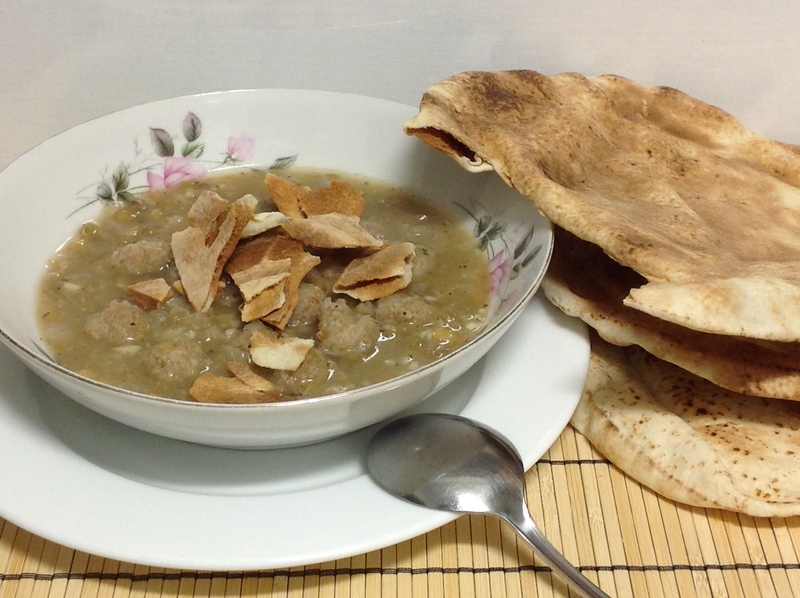 This one is traditionally eaten by Lebanese Christians during lent. It contains no meat or dairy. Our family eats it on the first day of lent while others will have it on Good Friday. I remember being in the kitchen helping my mum by stirring the big pot of soup while she put the little dumplings in. As usual I’ve got to say, this recipe is very easy and delicious. 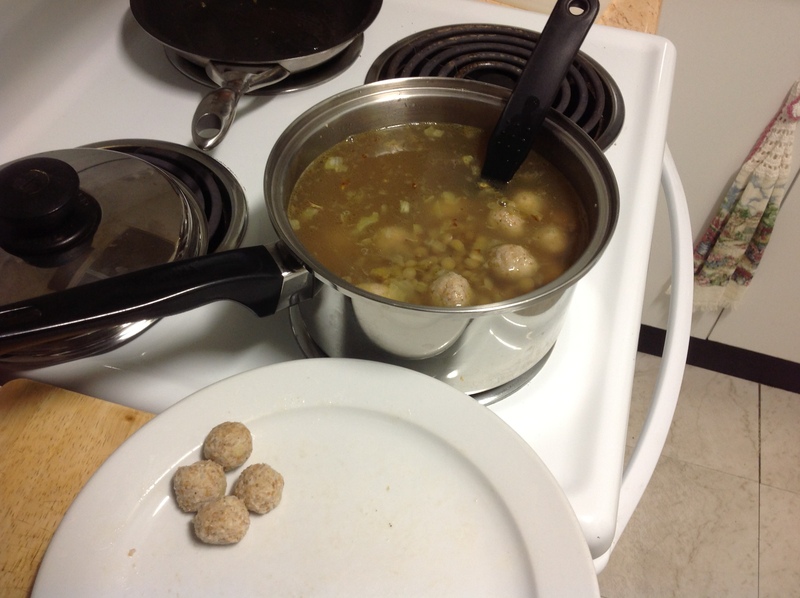 Make the dumplings by soaking 1/2 cup fine burghul (that’s been rinsed) in 3/4 cup cold water for about 30 minutes. The burghul will soak up all the water. Grate 1/2 a large onion (you’ll need the other half for the soup) and add it to the burghul with 1 tsp salt, 1/2 tsp ground pepper and 3/4 cup plain wholemeal flour. You can also add a little finely chopped mint leaves to the mix (I actually remembered the mint too late! Oh well, for this particular batch I’ll be adding it to the soup at the end. It’s all good.) Mix it all very well with your hands until you get a dough-like consistency. Keeping hands slightly wet, roll teaspoons of mix into little dumplings. Set aside while you start preparing the soup. 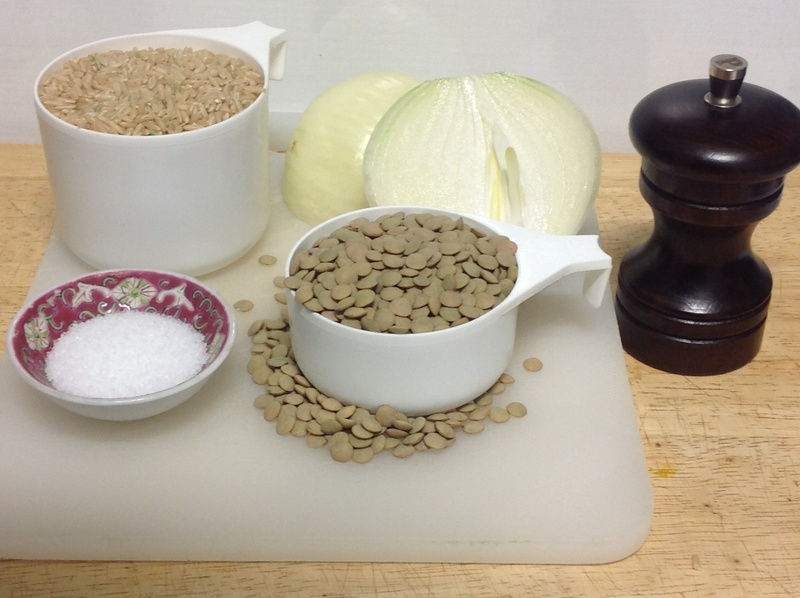 Rinse 1/2 cup brown lentils and put them in a large saucepan.Pour in 5 cups of cold water, cover and bring to the boil. 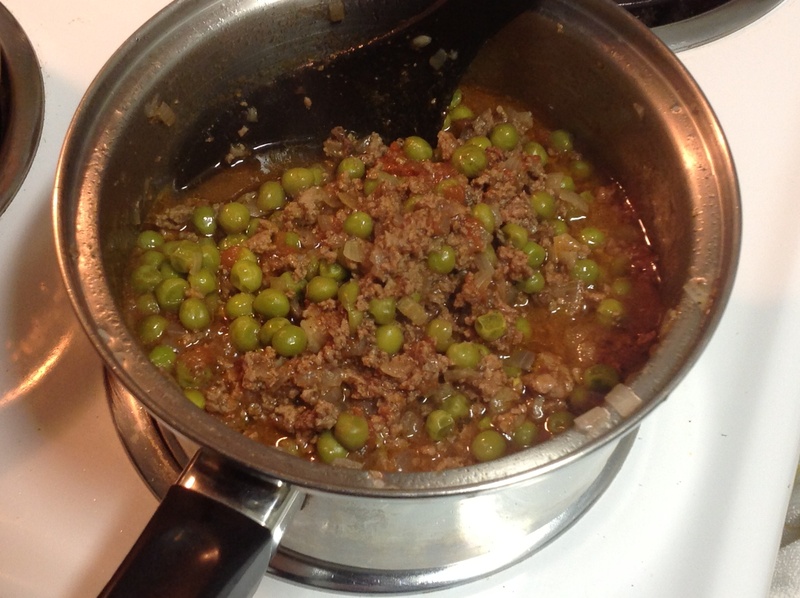 Reduce the heat and allow to simmer for 20 minutes or until the lentils are almost tender. In the meantime, dice the other half of your onion and cook in 2 tbs olive oil until starting to brown on the edges. Once lentils are almost ready, pour in the cooked onion along with the oil. Now, gently lower the dumplings into the soup. Carefully stir them around, cover the pot and allow to very gently simmer for about 10 minutes while you crush 3-4 cloves garlic in a mortar and pestle with 1 tsp salt, 1/4 tsp pepper, the juice of half a lemon and 1/2 tsp dried mint leaves (this is extra mint, not the lot I forgot to add to the dumplings….). After the 10 minutes, add the garlic and mint mix to the soup, stir, cover and leave to simmer for another 15 minutes. We serve this with lots of toasted Lebanese Bread. Brian (the Husband) had the day off yesterday. He decided it was about time he got in the kitchen and did some cooking. Now, Brian is the chief cheesecake and Anzac biscuit maker in this household, but he also makes a mean Lamb and Prune curry. 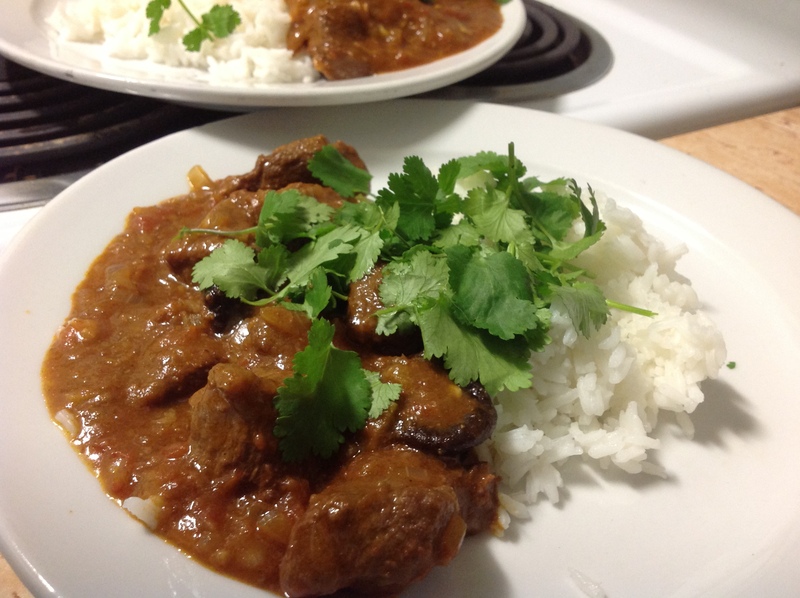 The original recipe calls for lamb shanks, but he used diced lamb instead. 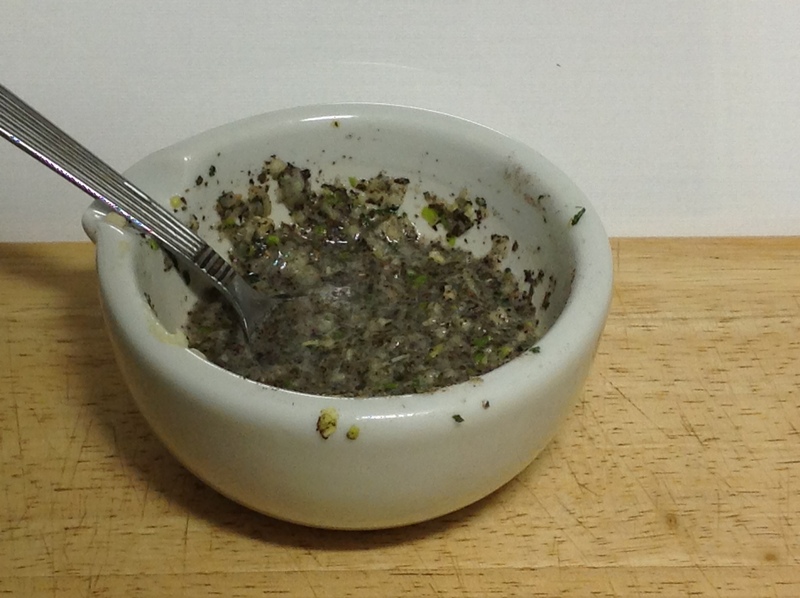 500g of it in fact, which he tossed in 1-2 tablespoons of plain flour, salt, pepper and 1 tsp ground cinnamon. Then heat 3 tablespoons olive oil in a heavy based saucepan and brown the meat all over. Take meat out, add a little more oil if pan is dry, throw in 1 large diced onion and cook for a few minutes until brown. Add 4-5 cloves finely chopped garlic, 2 tsp ground cumin, 2 tsp ground coriander, 1 tsp freshly grated ginger, 1 1/2 tsp smoked paprika, (Brian used a sprinkle of hot paprika as well), 2 tsp Harissa paste ( or minced red chilli) and 1 small dried red chilli. Cook for about 2 minutes. 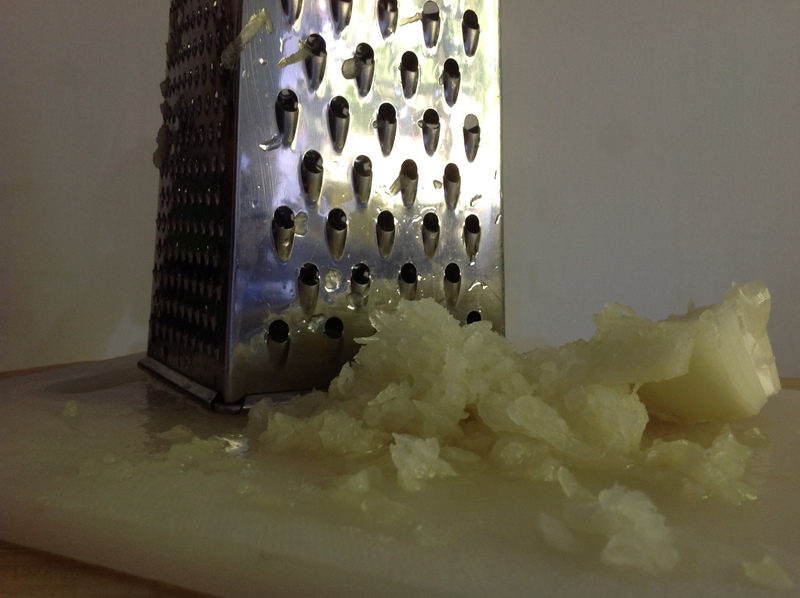 Add 1 piece preserved lemon rind – diced (don’t use the pith and flesh. You can also use 1 tsp lemon zest if preserved lemon is handy), 500ml beef stock,1 tbs raw sugar and 400g canned chopped tomatoes. Return the lamb to the pan, bring it all to the boil, reduce the heat to low and simmer, covered for 1 hour, stirring often, scrapping the bottom of the pan to make sure all the sticky bits make their way back into the sauce. In the meantime, soak a generous pinch of saffron threads in 2 tbs warm water and set aside to infuse. After one hour, add the saffron and its soaking water and continue simmering for another hour, with pan partially covered, adding 200g pitted prunes for the last 10 minutes. 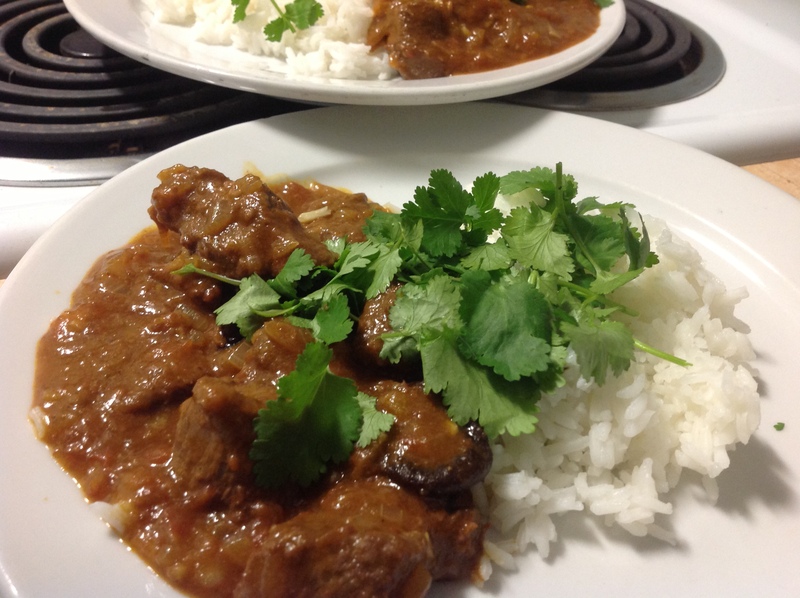 Brian serves this amazing dish with steamed rice and lots of fresh coriander. Okay, here in Australia, it’s barely 9am, but I had the urge for some baking. It’s school holidays here, and I’m off to my sister’s soon. My niece is having friends visit,so we’re taking them all out for lunch and I thought I’d make dessert for when we got home. In a small saucepan and on low heat, melt 115g salted butter with 115g dark chocolate and 2 teaspoons instant coffee granules. Set aside to cool slightly while you whisk 3 eggs with 200g castor sugar and 1 teaspoon vanilla, until the just mixed. Pour the cooled choc/butter into the eggs and mix till combined. 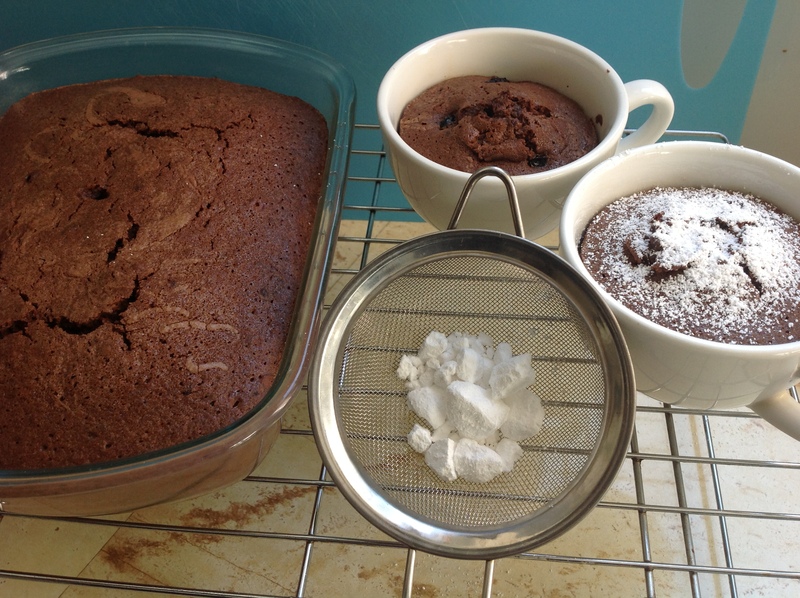 Sift over 140g plain flour, 25g cocoa powder and 1/2 teaspoon baking powder and mix all together. Pour into a well buttered baking dish (16cm x 20cm) and bake at 165 degrees for 40 – 45 minutes or until cooked. Because I’m me, I reserved a little of the uncooked batter for two smaller cup sized puds for my husband and myself to have tonight. In those went a few dried blueberries. Can’t wait….. This was a last minute meal, when mum didn’t have time to cook something long and slow. It seemed that it was on the stove one minute and in our plates the next. Mum was always good at doing that. Most of us have left home now, so she has a lot more time to slow things down and really enjoy cooking. We all still get together at mum and dads for lunch most Sundays. During the week mum will phone around and ask for lunch requests. There are so many of us, the menu can be very different from one week to the next, depending on who has chosen lunch for us all. The dining table has more than doubled since we all lived at home, what with partners and kids and sometimes friends. It can get very loud and chaotic, but we wouldn’t have it any other way…. In a medium saucepan gently heat 2 tablespoons olive oil then add 1 diced medium onion and 5 or 6 cloves chopped garlic and stir for about 2-3 minutes or until onion starts to soften. 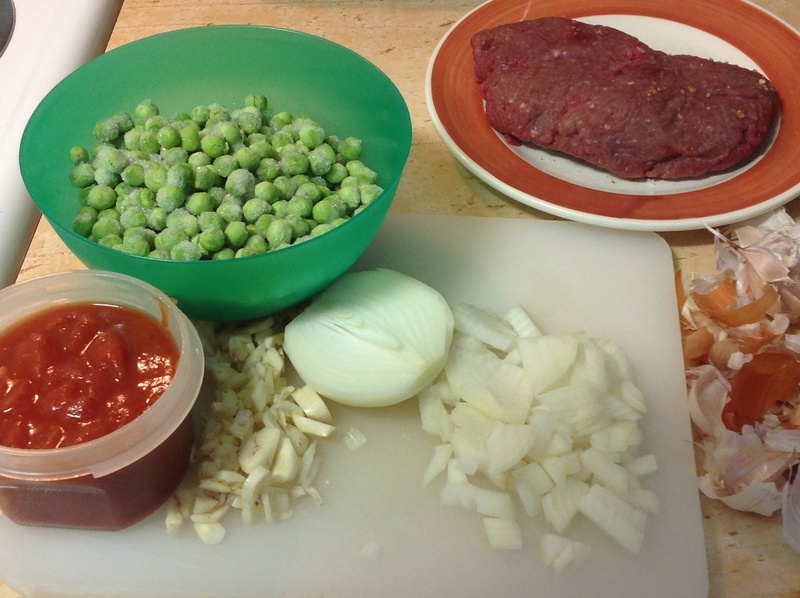 Add 200g lean beef mince and stir it into the onion and garlic mix, squashing any clumps of meat. Keep going until the meat has browned. Season with salt, pepper and 1 teaspoon ground cinnamon. Add 200g tinned diced tomato and about 1/2 cup of water. Cover and leave to simmer for 30 minutes, then throw in 200g frozen green peas, stir, cover, and let simmer for a further 20 minutes. 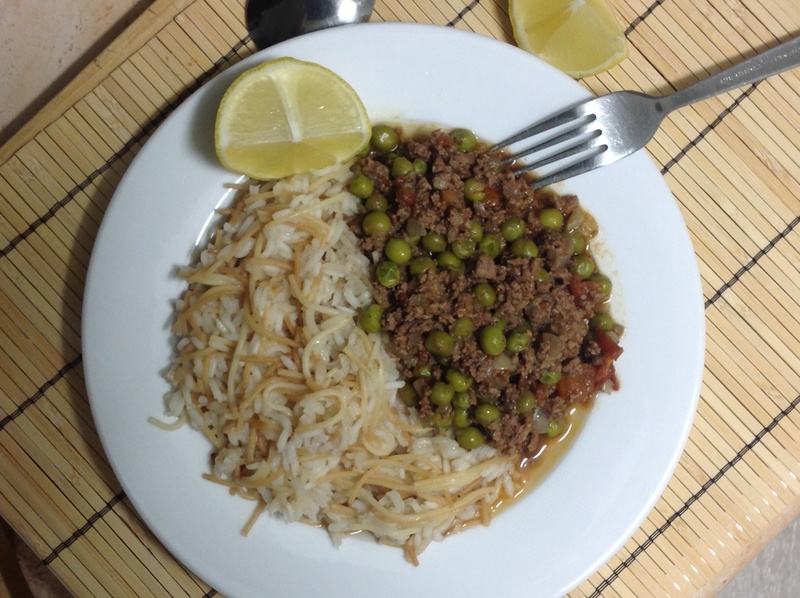 Now, this is served with rice, or in Lebanese, Riz, which has egg noodle vermicelli added to it. In a small saucepan melt 30g butter with 1/2 teaspoon olive oil. Crush 1 nest or 50g vermicelli egg noodles into saucepan and stir constantly until brown (careful, once they start to colour they darken very quickly and can burn, so keep stirring them). 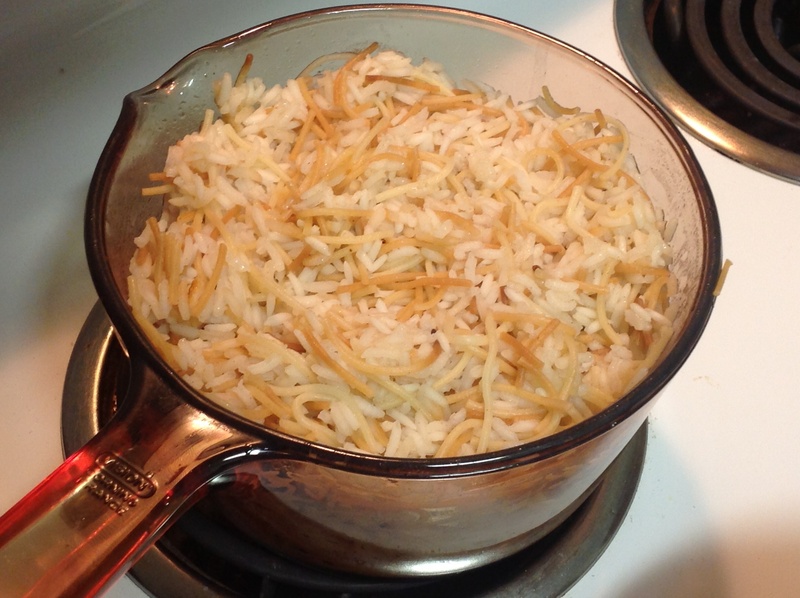 Add 200g rinsed long grain rice, 1 teaspoon salt and continue stirring for 1 minute coating every rice grain with butter. Carefully pour in 450g (nearly 2 cups) water (watch out for the steam), stir, cover tightly and leave for 20 minutes until the water has been absorbed and the rice is cooked through. Turn heat off and leave covered for another 10 minutes. Serve some Riz with the bazella and some lemon wedges on the side (lemon juice makes this dish even more amazing).